Egypt's political system has gone through enormous upheaval with the overthrow of President Hosni Mubarak, contested elections and the emergence of political Islam as a dominant force. The BBC's Shaimaa Khalil opens a series of reports on the challenges facing Egypt with a visit to her home town of Alexandria, the country's second city. The ride from Cairo to Alexandria shouldn't take more than two hours on a fast train. I remember how happy I always was as a child when we finally arrived at Sidi Gaber station. Even though I couldn't see the seafront just yet, I knew I was home. I haven't lived in Alexandria for decades and going back now as a reporter a few things have changed. The train ride lasts more than three-and-a-half hours now, a mixture of a very slow, not very well-maintained train and failing signals all the way. "They're extra cautious now, after the crash," a passenger tells me, noticing my frustration. A few weeks earlier, 19 people were killed and more than 100 wounded in a train crash in the Badrashin area in Giza, and in November 50 children aged between four to six years old and the driver of the school bus they were on were killed when their vehicle was hit by a train in the Manfalut area south of Cairo. What was once a childhood adventure now feels like gambling with your life. The train station itself, Sidi Gaber, has become the scene of much of the unrest that broke out in Alexandria recently. In November last year, thousands demonstrated here after President Mohammed Morsi issued a series of decrees giving himself new powers. One thing that hasn't changed in the city is the sea. Being a coastal city is what defines Alexandria and gives it, historically, its openness to others and its eclectic cultural heritage. As a child I remember asking my mother why Cairo didn't have a beach, and shouldn't every city have one? The beach is where Alexandrians go to escape the daily grind of life. And in the past two years, many will tell you, they have needed that escape more than ever. On the second anniversary of the 25 January revolution, violence broke out in Cairo, Alexandria and the Canal cities of Suez and Ismailia. At least five people died in Suez that day, and hundreds were injured across the country. Like the rest of Egypt since the fall of Hosni Mubarak, Alexandria feels polarised. As elsewhere, the two main issues are the economy and security. 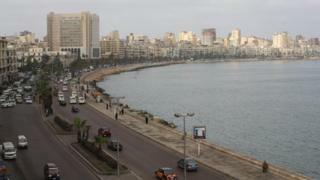 The Ibrahimiya neighbourhood is in the older part of Alexandria. This is where my grandmother's house is, now surrounded by high-rise buildings that overshadow the whole area. Over tea and my grandmother Amina's famous pastries, I asked her what she thinks of what's been happening in Alexandria and in Egypt in the last two years. "Just outside in the main street there were many clashes, I used to hear gunfire," she said. "So many people died. If you saw the mothers of those young men you'd feel very sorry for them. There's absolutely no security in Alexandra now." My cousin, Heba Saad, runs her own children's nursery and helps her husband with his pharmacy business. She voted for Mr Morsi in June 2012. "I had hopes," she said. "I thought that they suffered a lot and had so much trouble with the previous regime so they would be smarter than this. I guess this is because he wants to empower the Muslim Brotherhood, it's about their own benefits not Egypt's benefit." Others I spoke to accuse the Muslim Brotherhood of buying votes. They say that the support they've gained through years of grassroots work, especially for the poor, was actually just buying people off with charity handouts. People here in Egypt call them "the oil and sugar votes" - referring to the food staples handed out by the Brotherhood. I put these concerns to Mohammed Sudan, a senior member of the Muslim Brotherhood. "Let the others provide more services," Mr Sudan said, referring to the opposition. "They are richer than us - they can provide oil and sugar and meat too. It's a race! Don't blame the Muslim Brotherhood or the Salafi people if they provide the poor people with what they need." On the streets of Mahatet al-Raml in central Alexandria, two women, Shadia and Madiha, who were covered from head to toe in the niqab, told me that they had voted for Mr Morsi because they wanted to vote for Islam. "He's a good Muslim, he knows the Koran," Shadia told me. "Because he knows the Koran, he won't cheat, he won't be corrupt," Madiha explained. But two years on, they are both very disappointed. They live in a poor area in Alexandria and say they see very little of the police in their area. "So many robberies, and many thugs, and the police aren't doing anything to stop it," they complained. "There's also no money, my husband lost his job and we don't know what to do," Shadia said. For others, the rise of Islamists to power is the key issue. Dr Mahmoud Abodoma is the managing director of Teatro, a theatre and cultural centre. "My main fear is my freedom and the freedom of the people also, given the growth of the religious people in Egypt, especially the Muslim Brotherhood and the Salafis. I don't know but I have this feeling that they are against culture by nature. It's a religious fascism," he argued. Of course, Mohamed Sudan of the Muslim Brotherhood doesn't see it that way at all. He insists that he and his group are as Egyptian and patriotic as everyone else. "The Muslim Brotherhood is not the enemy of the Egyptian people. Are we dividing the people belonging to the Islamic movement and non-Islamic movements?" he asked. But this feeling of division is evident in many places and certainly in Alexandria. The Qaed Ibrahim Mosque was the city's Tahrir Square of Alexandria during the 18 days of the revolution. Millions gathered, calling for the fall of Hosni Mubarak - and when he fell, this is many came to celebrate. More recently it was the scene of violent clashes between supporters and opponents of President Morsi. Listen to The Documentary: Egypt's Challenge on Tuesday 23 April on the BBC World Service.